What Joseph Hyman, Alex Wing and Ezekiel Kolajo have come up with is nothing short of amazing. They’ve literally reinvented the cup of coffee and it all started during the miserably cold and snowy winter in Baltimore Maryland. Hyman, was studying at UMBC. He was fading fast as he was studying and needed a cup of coffee. It was freezing outside, so a trip back to the dorm to brew a cup wasn’t worth the trouble. He had also grown tired of spending $2.50 on something he could easily make on his own. It was there, that the idea for MoeJoe was born. After that Aha moment on campus that night Hyan turned to the Alex Brown Center for entrepreneurship for guidance on where to go with this idea. He wanted to create an insulated, covered coffee cup that brewed it’s own coffee, on the go. Sure there are thermos’s, Kuerigs, heat and go cups and pour and go cups as well. But the problem with each and every one of those alternatives for busy people, is the coffee is not fresh brewed when it’s time to drink it. Really, why pay for gourmet coffee just to put it in a thermos and drink it late. For people who like coffee there’s nothing better than a freshly brewed cup. After the team began working on the initial design they started to see the true value in the MoJoe Brewing System. No longer was this a plight to get Joe his cup of Joe on campus, but MoJoe Brewing is saving people’s most precious asset, and that is, time. The average coffee drinker in America goes to a Starbucks just abut every day. They spend $3.25-$5.00 on every cup of coffee and they stand in line on a low average of 10 minutes per trip. This doesn’t even consider folks who take multiple trips to the same Starbucks. Sure Starbucks is good but so is a freshly brewed cup of coffee using coffee you bought at Trader Joe’s, Wegmans or even Kroger. You bought that coffee for a reason but you only drink it Sunday morning? Very liberal math suggests that by brewing your own coffee on demand and wherever you are, could save you $1500 or more dollars per year. But more importantly it cold save you 120 hours or more. That’s five days, and a whole work week. 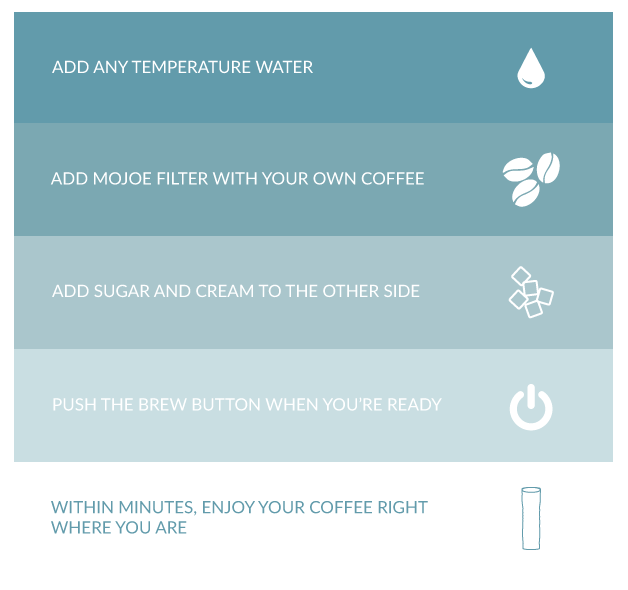 MoJoe can heat any temperature water to the correct temperature for brewing. Your coffee grinds go into one reservoir with a filter while your water, milk and sugar go into another. 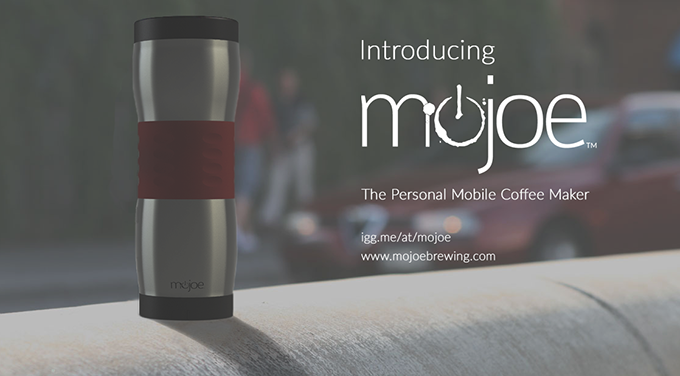 The MoJoe is insulated so you can even hold it while it’s brewing. The MoJoe costs less than a Kuerig meaning you could pick up two or even three of them so you always have a clean MoJoe. The rechargeable brewing system means you an brew your cup of coffee in the car, on the bus, on the subway, at the office, or even at a baseball game. Find out more here. and here.